Now that I've finally shed the pounds I gained during our visit to Barcelona, I feel like I can finally blog about our experience. I can't even begin to explain how much food we consumed on this trip. It made up 90% of our budget. 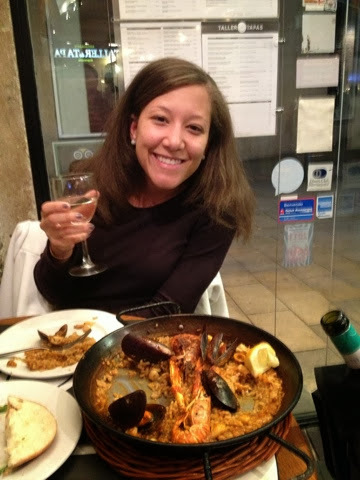 I told you I would go back to Spain, but who knew it would be 8 weeks after my first visit to Madrid? This trip was amazing to say the least, and we immersed in the culture complete with small breakfasts that always included fresh squeezed orange juice, large lunches, ciestas, and small tapas for dinner. IT WAS HEAVEN! I love the life of a Spaniard! When you arrive you most likely won't be in the same terminal as the train to the city. You'll need to take the shuttle bus to Terminal 2. When you get to the train buy the T10 pass. It only costs about 10.30 Euro, and you can share the card with your companion. This will get you most places around the city. We still haven't figured out why this pass worked for us to get to the city but not back to the airport. Maybe you will have better luck figuring that one out. Just be warned that it might not be as smooth of a trip back to the airport so leave plenty of time. When returning to the airport from Barcelona Sants metro stop remember a train leaves at the top of the hour and at the half hour. Try not to cut it close like we did because the shuttle bus at the airport from the train stop to Terminal 1 takes about 20 minutes. Don't miss your flight! Check this site out, here, before you plan your last day. During graduate school I was lucky enough to have a Spanish post-doc from Barcelona. I never stopped hearing about this amazing place, and her hometown of Blanes, Spain. It's pronounced Bl-an-es (not like Planes with a B; more like Flan with a B and an -es...you got that, right?). We always talked about one day how I would visit with them when they visited back home, and I'm so glad that it finally came true! I'm not only lucky to have had these Spaniards as friends to see their beautiful hometown, these two have given me so much insight into life. They've taught me to enjoy every day and helped me through some really rough times during graduate school. I owe them both a huge THANK YOU for all the support and advice. Can you pick out the Spanish people? Sushi making lesson date night with my favs. Celebrating passing my oral defense at our favorite place for happy hour! Okay, back to the trip! First, we stayed at Hotel Oasis, which was a great price for a perfect location. It's located one minute from the Barcelonetta metro stop and it's in the El Born area. The El Born area is amazing. Tons of restaraunts, right next to the beaches and night life (although we never made it out to the beach or any night life). The hotel walls were thin, and super tiny, but how much time are you spending in your hotel on a trip to Barcelona???? We were in walking distance to a lot of major sights, and when we wanted to hop on the metro it was right there! 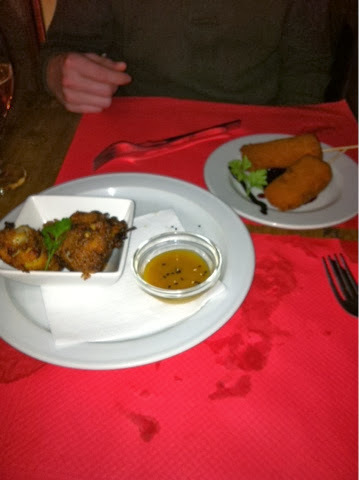 We arrived the first night late and decided to get tapas at the bar next to our hotel. We tried some new and exciting foods and were already in love with this city. The next morning we woke up and stumbled upon this amazing cafe with croissants dipped in chocolate. The orange juice was freshly squeezed, and while we thought it was only at this fancy cafe, we quickly learned that every morning we would have freshly squeezed orange juice! 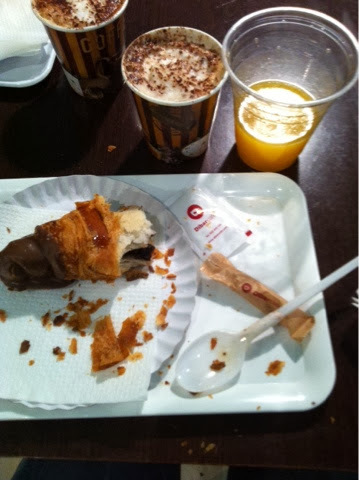 The breakfast specials consisted of 2 coffee's, 2 orange juices, and 2 croissants for only 7 Euro. Ah-mazing! Whatever you do, do NOT buy the breakfast at the hotel. There are so many cute cafe's to choose from around here! I ate this so fast I almost forgot to take a picture! We then headed to the Picasso Museum to see some of his art. We had fun checking out paintings he did as a young boy, and seeing a few of his cubism paintings. Unfortunately they don't allow any pictures. All the more reason for you to visit! Next we ventured to a large indoor market. So much fresh fish and jamón ibérico. Everything looked delicious! We walked to the gorgeous cathedral of the city. After seeing so many of the cathedrals in Germany, it was really amazing to see a different architectural style. This church is dedicated to a thirteen year old girl, Saint Eulalia, who stood up for her beliefs in the church during Roman times when Christianity was looked down upon. She endured thirteen tortures before death. There are many symbols for the martyr of Eulalia including the 13 white geese that live inside the Gothic cloister inside the cathedral. When you walk along the left side of the church you come upon a tiny room that contains old roman columns that were rediscovered and known to be from the Temple of Augustus. They were huge, and it was amazing that they were still intact while the city built around them. Catalan independence flags were everywhere. So much pride! Our first lunch consisted of sardines, veal, and paella. Sardines are a specialty that you should try while you're here. Just do it! They were surprisingly salty and delicious on bread! This one's for you Sarah and Jenn! We took the train to Blanes the next morning. We were running late and stumbled upon the fact that vending machines here sell chocolate croissants. Reason number 1,233,899 why I love Spain! It was a beautiful 45 minute ride with a view of the sea the whole way. When we arrived we were greeted by the always smiling face of Jesús. 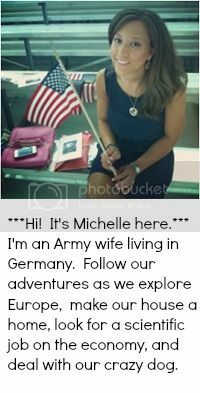 We had so much fun exploring their hometown and meeting their whole family. We started our day with two hikes to see the gorgeous views of the Costa Brava. The view during our train ride. Eve and her gorgeous baby girl! See the rocks jutting out in the water? That's the start of the Costa Brava! It starts in Blanes and goes to the French border. Our view behind us were mountain ranges. We hiked up to a castle to eat some tapas around 1PM. Finally drinking the beer they introduced me to in the states as a non-import in Spain! After our short tapas break we headed to lunch (3PM) and had the most amazing gourmet burgers. Not to be confused with a Big Mac. This was made with the finest beef topped with fine cheeses. We drank cava (Spanish champagne) that was produced in Blanes. After our burgers we enjoyed the richest chocolate muffins filled with chocolate, and a Mojito ice cream that included a substance like pop rocks! After dessert, we all enjoyed a shot of Espresso. Then when we thought we were finished the owner brought out a digestif shot! The courses never ended, and it was amazing. After we were stuffed, we headed home to go to the 3 Kings Day parade. I love this holiday and wish America could adopt this tradition. As you've probably guessed this day celebrates the 3 Wise Men coming to greet baby Jesus with gifts. Everyone carries lanterns to the parade and there's a huge parade with the 3 Kings throwing candy to all of the children. We had so much fun celebrating with their family. It was also nice to see the friendliness of the small community. Eve and Jesús knew everyone there, and we met so many members of their family who treated us like family. Now I know why they miss home so much! I was very excited to hold the lantern! This is the log that the kids hit on Christmas day and hope it "poops" out gifts from under a blanket at its rear while they pray in the other room. One of the 3 Kings throwing candy! That night we took the train back to Barcelona and found the only American sports bar that was showing the 49ers play off game (yes, they run our life even on vaca). We unfortunately were surrounded by study abroad students rooting for the Packers that night. It was odd to realize how how much we've grown and been through since our college days. Their version of "watching" the game consisted of trying to hit on one another and buying the cheapest shots they could find. Were we like that back then? Say it ain't so? The next day, we took the advice of friends who had visited Spain and decided to do the Fat Tire Bike tour. It was amazing, and the perfect way to see all of the city in a 2-3 hour time span. I highly recommend this tour. The tour guides are filled with a wealth of knowledge on the city history. We didn't have to pre-reserve our spots, and just showed up at the meeting spot. You can find more information, here. The old Bull fighting stadium. Barcelona recently outlawed bull fighting, so if you want to see one you'll have to go to Madrid. 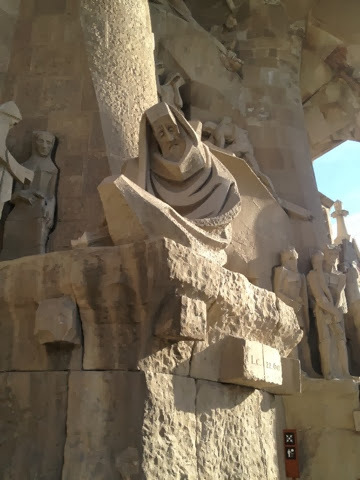 The Sagrada Família! We were struck with awe! Man made beaches for the 1992 summer Olympics. They buy sand from Egypt every year to make these beaches! If you want a real beach experience go to Blanes, Spain! Bike rides and sunglasses in January make me happy! The beginning of our tapas and pintxos afternoon bar hop! 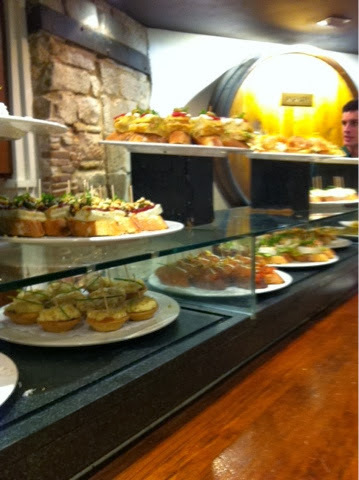 Pintxos are tapas served by the toothpick and cost 1-2 Euro each. They have everything from fresh seafood, iberian ham, and cheese stabbed on these little sticks of goodness! When you're finished they just count up your toothpicks and they tell you how much you owe. So easy! I'm hoping someone opens a place like this in C-bus. Don't you think it would thrive in the Short North? 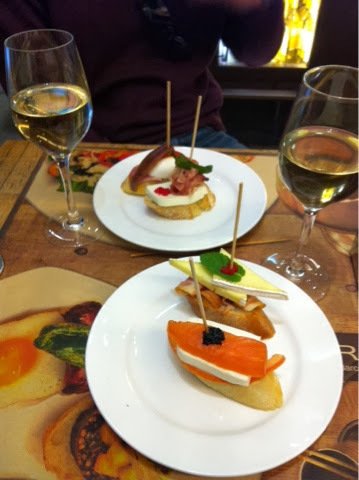 Pintxos! Pick whichever pintxos your heart desires then move on to the next bar! 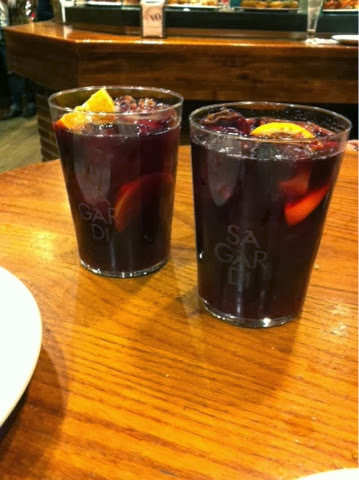 Sangria at our favorite spot, Sagardi! We decided to walk off our tapas and pintxos bar hop by going to see a few sights we didn't want to miss. I thought it was going to be pointless to see these at night, but they were beautiful all lit up! Casa Batlló on the Block of discord. 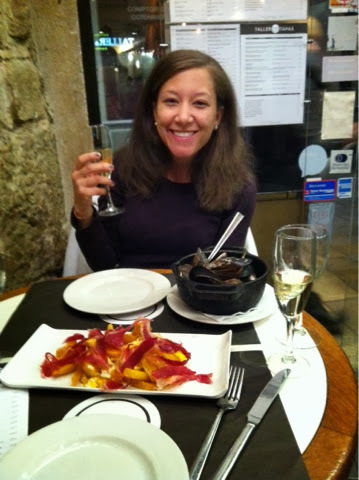 Fresh Mussels, Cava, and iberian ham on bravos! We HAD to get more paella before we left. Is this the definition of overeating? Before our flight left, we went back to the Sagrada Família and toured the inside. It was awesome to see a cathedral in the making for once instead of the ones in Germany that are from the beginning of time. Hopefully one day we can take our kids back to see the final product! It was started by the famous Antoni Gaudí in 1883 and is projected to be finished in 2026 for the 100 year anniversary of Gaudi's death. This cathedral is like none other in the world and has many facades of Christ's life with hints of nature (Tortoises, lions, trees, right down to the holy water served out of giant clam shells). The inside makes you feel like you're in a rain forest complete with large trees and a canopy. The final product will have a spire in the center that is 170 meters high (1 meter shorter than the tallest mountain in Barcelona- he believed that nothing should surpass what God has created). 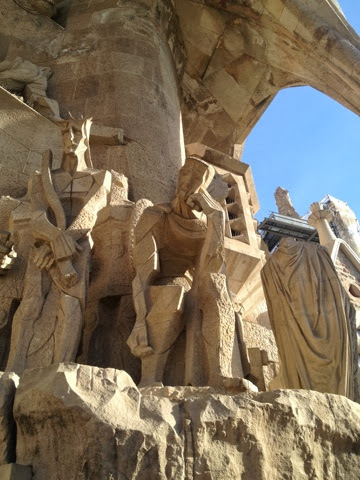 I love Gaudi's famous quote when asked about why it will take so long for the church to be built, "My client is in no hurry." **Tip** If you tour the inside make sure to pay the extra amount to take the elevator up the top to get a view of the city. Plus you are INSIDE the spires! Great experience! When complete there will be 18 total spires. Can you see all of the detail? When you take the elevator up you will descend down the left spires! Holding on to the Sagrada Familia! Barcelona from the Sagrada Família. That's all folks! I hope you hung in there for the longest post of your life! We loved our trip and will definitely be going back to Barcelona before we leave here. We still have so much more to explore: Monjïc hill, Modernist Park Güell by Gaudí, sun bathe on a beach, and dance the night away in a night club! Until next time Spain! The essence of celebration - A visit from Mom!